I love remodeling old furniture. We were cleaning out a spare room when I found this desk makeover project. When I have time, I try to think of a creative way to refurbish my furniture. My project is this desk. It was in the spot my craft table is in now. I always forget a before picture, and I remembered after I started sanding the drawer. oops, now it’s obvious I’m addicted to Amazon. I removed a drawer and tested my artwork on the one you see on top. After I finished that drawer, I knew I was going to like it. So I removed the rest of the drawers and sanded. You don’t have to sand or prime when chalk painting. I had to because the old paint job was horrid and I wanted the wood to show through. Sand in the direction of the wood. You will want to do this outside. 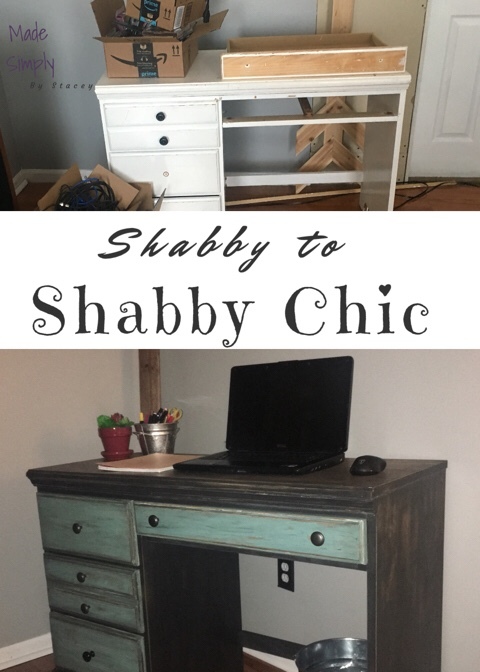 I didn’t want it to be perfect because using chalk paint I was going to sand bringing through the stain of the wood and the old paint. Then I stained with Jacobean, which is a dark stain. Of course, before you paint or stain anything, clean it up. Paint will not stick to dirt, at least not very well.
. I always paint in the direction of the wood. After the paint dries, apply another coat. Do this until you get your desired look. After the paint dried, I hand sanded with fine grit sandpaper while paying more attention to the edges to bring through some wood and the old white. Then I added some black paint, just random streaks and sanded some more. The shell of the desk I took to the garage and stripped the paint. When using stripper read the instructions on the can. This has a strong odor so make sure the area is ventilated well. There have been times when I thought I may have been drugged after doing this. The garage door is fully opened when I do this. Then I got out my handy little electric sander and sanded away. I wanted the top of the desk to be stained and look like rustic wood, so I sanded it to the bone. This was an old desk with a lot of indents, so there are still some white specs showing through. When I was done sanding, I cleaned up the desk. You may need to fill cracks and holes. I was lucky and didn’t see anything I wanted to cover. Sand with a light grit after doing this. I used an air compressor to blow all the leftover from sanding. Then I wiped down the furniture with a wet cloth and dried it with a dry cloth. I always use old cut up t-shirts. They are the best for DIYs. Not much lint. I stained the desk with Jacobean. I use a sponge brush to apply the stain and cut up an old t-shirt to wipe it off. Then you wait because this is not a do it in one day project. You have to let layers dry. I used newspaper and painters tape to completely cover the top of the desk to protect it from overspray. I painted the rest of the desk with a charcoal chalk paint. If you aren’t used to spraying paint, practice first or you will have a lot of runs. I use short, small strokes. Then sanding again with a fine grit to bring out the Jacobean on the edges of the desk and down the sides. I like to finish chalk paint projects with wax. It seals and protects the project. Then I reassembled the desk and added new knobs. I did forget a knob, so one doesn’t match (character). It ended up looking great. My husband: What are you doing with that desk? Me: I’m going to redo it and sell it. My Husband: I thought you were going to sell that desk. Me: Well now I really like it. My Husband: What are you going to do with it. Me: I’m going to display my handmades on it. My Husband: You mean the handmades you were going to sell. You are turning in to a hoarder. Ta-da no I have a Shabby Chic desk. I hope you love it like I do.